WAIST HIGH: Happy 25th Birthday Under A Blood Red Sky. 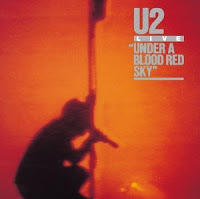 Happy 25th Birthday Under A Blood Red Sky. And Happy 25th Birthday Live At Red Rocks. It has been announced that U2's first concert video, Waist High favorite Live At Red Rocks, will finally be released on DVD by Interscope/Island/UME on Sept. 30 along with the accompanying live album, a remastered Under A Blood Red Sky. Recorded at the Red Rocks Amphitheatre in Colorado on Jun. 5, 1983, Live At Red Rocks will now be available for the first time on DVD, "and will include 5 previously unreleased songs, a director's commentary, digitally re-graded pictures, and a 5.1 mix." The remastered Under a Blood Red Sky was originally released in November 1983, "and consists of live recordings from three shows on the band's War Tour through Europe and America." Produced by Jimmy Iovine, Under a Blood Red Sky "is the best-selling live recording ever in the UK," and although "billed as 'Live from Red Rocks,' only two of the tracks on the disc were recorded there. Unlike the album, the concert video was recorded entirely at the dramatic outdoor Red Rocks Amphitheatre." This post dedicated to the original "Party Girl," a Waist High friend since about 1983, the lovely "Ann."